Set amidst flowering cactus and framed against the majestic McDowell Mountains lies the Hyatt Regency Scottsdale Resort and Spa at Gainey Ranch. Here, breathtaking desert vistas blend with intriguing Native American culture and pampering amenities to create a hotel designed to please every guest. Discover your own perfect vacation with championship golf, luxurious Spa Avania, water playground, tennis or Camp Hyatt Kachina. 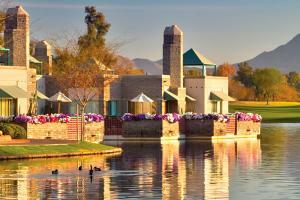 Located only 18 miles from Phoenix's Sky Harbor International Airport.